I came across this article and was SHOCKED that this was the way that some of our mothers and grandmothers were to behave. Mr. Wright is lucky if he doesn't get handed a screaming, poopy baby and asked to make dinner while I run out the front door looking for the nearest padded room. This reeked of something I needed to check out on Snopes, so I did a quick search and it is listed as undetermined, but there is a photocopy of the 'actual' article there. * Have dinner ready. Plan ahead, even the night before, to have a delicious meal ready on time for his return. This is a way of letting him know that you have be thinking about him and are concerned about his needs. 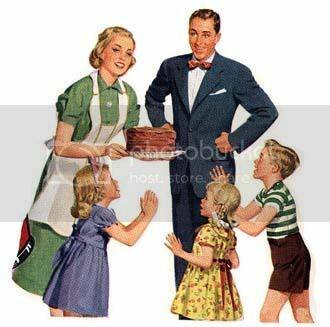 Most men are hungry when they get home and the prospect of a good meal is part of the warm welcome needed. Mrs. Wright says: I can understand this one as everyone needs to eat, but I hardly think that the Kraft macaroni I make for Mr. Wright screams "I've been thinking about you and am concerned for your needs". Mrs. Wright says: I didn't get that fancy for my wedding. If I wasn't so busy thinking about him and being concerned for his macaroni needs maybe I'd look more rested. Mrs. Wright says: I don't think anyone would argue with the fact that I'm always a little gay, but I'm never interesting. I think Mr. Wright would rather I not talk over Sportcenter anyway. Mrs. Wright says: I totally run through the main part of the house before his arrival, but usually it's because I'm chasing a peeing toddler or checking for Target purchases that need to be hidden. And sometimes I even wipe off the table before he gets home to remove the evidence that we had Cocoa Pebbles for lunch. * During the cooler months of the year you should prepare and light a fire for him to unwind by. Your husband will feel he has reached a haven of rest and order, and it will give you a lift too. After all, catering to his comfort will provide you with immense personal satisfaction. Mrs. Wright says: We never really have to worry about the washer, dryer or vacuum being too noisy as they tend to only be noisy when running. If you don't run them, there's no noise. Problem solved. As for the children... ARE YOU FREAKING KIDDING ME?? If it worked to encourage them to be quiet don't you think I would have 'encouraged' that 8 hours ago?? Mrs. Wright says: I'm always happy to see him because sometimes he brings home Burger King. He's also the only person I live with that stops asking for things for 10 seconds to wait for a response. Mrs. Wright says: This sounds like some kind of strange fantasy of Mr. Wright's. I would have thought he wrote this whole article if there were one or two more 'rules' involving things that weren't spoken about then, lol! Mrs. Wright says: Excuse me!? HIS topics are more important than MINE!? No one cares which minor leaguer Jim Rome interviewed today but the people want to know about Brangelina!! Mrs. Wright says: Is "there's a really bad smell and I can't figure out where or who it's coming from" a complaint, or a problem? * Don't complain if he's late for dinner or even if he stays out all night. Count this as minor compared to what he might have gone through at work. * Make him comfortable. Have him lean back in a comfortable chair or lie him down in the bedroom. Have a cool or warm drink ready for him. Mrs. Wright says: Are you sure he doesn't want his 1955 skank to lie him down in bed? Mrs. Wright says: Mr.Wright has the kids trained to take off his socks when he gets home, but I get the joy of picking up said socks and taking them to their home in the LAUNDRY pile. It's not rocket science people! I usually reserve the low, soothing voice for admitting the dollar amount that I spent at Joann fabrics. Mrs. Wright says: Luckily the law says I do have a right to question him, and if he's still with that skank then I have the right to the house, cars, and kids as well :) God Bless America! 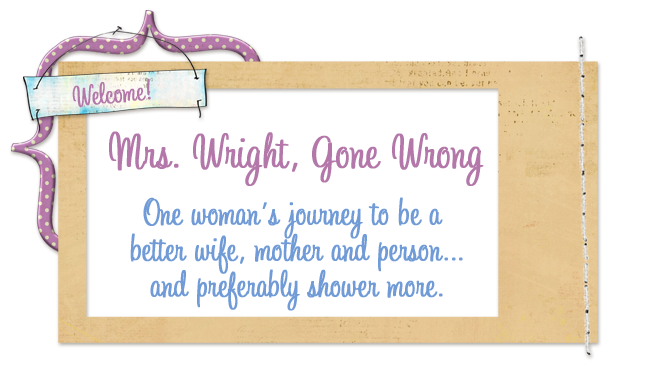 Mrs. Wright says: I sure do know my place, and it's not 2 steps behind my husband attending to his every whim. Plus Mr. Wright never knows where to put anything, so I'd have to show him where to "put" me anyway. "Don't complain if he's late for dinner or even if he stays out all night. Count this as minor compared to what he might have gone through at work." In the words of Madea: Hell to the No!! Well, it seems someone has been peeking in my windows. That's a big no-no! I may have to tickle them with my feather duster, after I make the 5 course meal I have planned, scrub the toilets, give hubby a massage and put on a fresh coat of lipstick! Sent you a little something...come and see! You were cracking me up! I LOL'd at the quieting the kids before he gets home.